Colebrook Town Hall is located at 17 Bridge Street, Colebrook, NH 03576; phone: 603-237-4070. 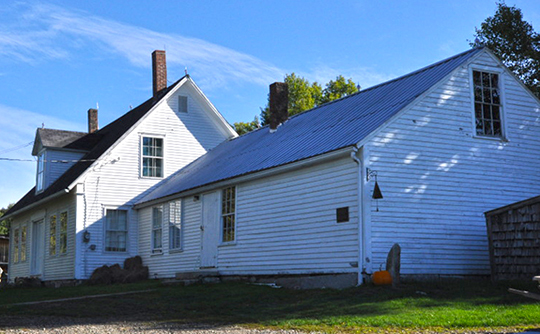 Photo: Benjamin Aldrich Homestead, Shaw Road, Colebrook, NH. Listed on the National Register of Historic Places in 2003. Photographed by User:Magicpiano (own work), 2016, [cc-by-4.0 (creativecommons.org/licenses/by-sa/4.0/deed.en)], via Wikimedia Commons, accessed September, 2017. The area that is now Colebrook was originally sold twice. In 1762, Governor Benning Wentworth sold it to 64 individuals as "Dryden." The requirements of the deed were not honored, so in 1770, Governor John Wentworth sold it to Sir George Colebrooke as Colebrook Town. Again, this time because of the Revolutionary War, the land was not occupied. Thus, when the first settlers came into this area around 1780, no one owned the land. They settled wherever they wanted to and took as much land as they needed for their own purposes. The census of 1790 completely ignored the town's physical being, although several settlers had already established themselves here. In 1795, with thirty families in the town, the need for recognition and incorporation was felt, and a petition bearing their names was presented. On June 11, 1796, the town became incorporated. From this time on, the town grew rapidly, and by 1800, it had 160 inhabitants. The first school was erected in 1795 and the first church, the Congregational, was founded in 1802. Agriculture and lumbering were the important industries at the time. Lumbering and its products created several fortunes and provided cash incomes for generations of our citizens. The first sawmill in the Colebrook area was built and run by the MacAllaster brothers about 1800. In the course of a hundred years, about 16 sawmills were known to exist. Brick kilns were also one of the first industries in town. The first one known to exist was behind the present Colebrook House. The Walker House, which still stands today, has some of those bricks in its walls. Having many sheep on the surrounding farms, a woolen factory was operating in Factory Village about 1825. Two grist mills were also up and running. About 1840, as farmers were producing many bushels of potatoes, the starch and potato whiskey industries grew. One factory was in Kidderville, another at Factory Village, and a third in Colebrook Village which was owned and operated by Sherburn Merrill. The inhabitants of the area, being industrious, started bobbin mills, cooper mills and a foundry that began around 1870. To operate these mills, waterpower was provided by the building of dams on the Mohawk River and its tributaries. It is estimated there were about 16 dams on these rivers. Just before 1900, the dairying industry came into its own, exporting raw milk to cities as far away as Boston. This was feasible with the coming of the railroad and the harvesting of ice from ponds in the winter. Cans of milk were packed with ice and shipped by boxcar. Between 1944 and 1959, there were three milk companies located on Depot Street (now Colby Street). They were H.P. Hood and Sons, United Farmers, Inc., and Whiting Brothers. There were between 300 and 400 farmers in the surrounding area and in the month of June alone, these farmers would ship about 2 million pounds of milk a day. This short history brings us to the 1900's and beyond, but the people of Colebrook are still inventing new ways to live and survive here. Some examples are tourism, Christmas tree farming, and the production of maple products. Colebrook now serves as the business, banking and professional center for a large area of New Hampshire's North Country and Vermont's Northeast Kingdom. Located within sight of Dixville Notch in the state's most beautiful section, nature and our people have worked together to produce a lovely and tranquil town. As a vacation area, it is not to be excelled. Tourists and sportsmen are provided with the finest in golfing, fishing, hunting, skiing and snowmobiling. Every need for comfortable living can be met here—churches, libraries, excellent schools and a new, modern hospital. Colebrook Planning Board, Master Plan for the Town of Colebrook, 2013, www.colebrook-nh.com, accessed September, 2017.